Well, a few weeks ago we traveled west on US-12, so this week Roadtrip-'62 ™ heads back east to travel US-13. This highway runs from Morrisville, Pennsylvania to Fayetteville, North Carolina, 517 miles overall. It crosses through Pennsylvania, Delaware, Maryland, Virginia, and North Carolina. And though it runs across the entire north-south dimension of Delaware, it crosses a mere 36 miles of Maryland. Highway US-13 crossed neither our US-6 nor US-23 roadtrip. But we did meet it in one other post, at Wilmington, Delaware, when I discussed route US-202. As US-13 travels through north Philadelphia, Pennsylvania, it crosses the oldest surviving roadway bridge in the United States. The Pennypack Bridge was constructed in 1697 (yes, over 300 years ago) and is a three span, twin stone arch bridge over Pennypack Creek. It was built to connect William Penn’s mansion and the cities of New York and Boston with the new city of Philadelphia and was an important link on the King's Highway. Parts of that highway from Trenton, New Jersey to Philadelphia are now US-13. The bridge was originally only ten feet wide but it was widened in 1893 to accommodate streetcars. It was widened again in 1950 to its current width, to better accommodate automobile traffic. But an even more famous landmark in Philadelphia was also open for visitors in 1962. If you were driving US-13 through Philadelphia, Pennsylvania, no doubt you would have stopped to see the Liberty Bell and Independence Hall. The bell weighs about 2000 pounds. It is made of 70% copper, 25% tin, and small amounts of lead, zinc, arsenic, gold, and silver. It hangs from what is believed to be its original wooden yoke. At the time of the American Revolution and still in 1962, it hung in the tower of the Pennsylvania State House, now known as Independence Hall. 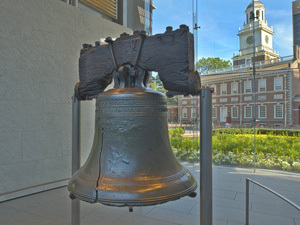 In 1976, the Liberty Bell was moved to a glass pavilion in Independence National Historical Park where it can be viewed by the public 24 hours a day. After passing through downtown Philadelphia, US-13 runs within a few blocks of the Philadelphia Zoo, located on the west side of the Schuylkill River. This is credited with being the first true zoo in the United States, and was opened in 1874. It opened with 1,000 animals, which even today is a large zoo, as it currently has about 1,300 animals. In its early years, it also housed animals obtained from safaris on behalf of the Smithsonian Institution, which had not yet built the National Zoo in Washington, DC. It started as about 11 acres but has grown to 42 acres today, and nearly all of the original buildings and exhibits have been replaced, mostly after 1962. But because of the landscaping, there is still a Victorian garden atmosphere in some areas. In keeping with the Victorian times when the Philadelphia Zoological Garden opened, it included a carriage house for the horses that visitors arrived on. 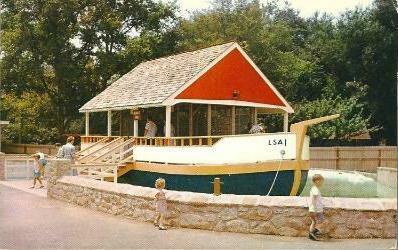 The Philadelphia Zoo currently features a children's zoo, a paddleboat lake, and a rainforest themed carousel. Also on the grounds is The Solitude, an elegant English manor style house that was the home of William Penn’s grandson, John Penn. It was built in 1784 before the zoo existed, but was included in the land the zoo leased when it opened. The Solitude still sits within its original landscaping on the bank of the Schuylkill River. Before you leave Philadelphia, be sure to grab a real Philly Cheesesteak at one of the many restaurants serving this authentic local sandwich. For those who may not know what a cheesesteak is, you start with a long, crusty roll and fill it with thinly sliced sautéed ribeye beef. Melted cheese goes on top, generally Cheez Whiz, and often fried onions. Other toppings may include different cheeses, sautéed mushrooms, ketchup and hot or sweet peppers, but these are just frills and not part of the authentic cheesesteak. The sandwich began in 1930 when a South Philadelphia hot dog vendor named Pat Olivieri decided to put some beef and onions on his grill. The aroma attracted local taxicab drivers and Pat opened a shop selling his concoction on 9th Street in 1940, now known as Pat’s King of Steaks. Cheese was added about 20 years later, possibly by competitor Joe Vento. Cheesesteaks are now a Philadelphia civic icon, a tourist draw and a cultural obsession, and are often imitated around the world. Just a few of the many places to get an authentic cheesesteak are Pat’s King of Steaks, still owned and operated by the Olivieri family, and his long-time competitor across the street, Geno’s Steaks. John’s Roast Pork is another favorite, also opened in 1930 and known for using a seeded roll. Other long-time purveyors of the sandwich are Dalessandro’s Steaks and Cosmi’s Deli, which has been around since the 1930s. And Shank’s Original opened in 1962! The cheesesteak is literally everywhere in Philadelphia, in varying quality, at steak shops, delis, food trucks, pizzerias and even some high-end restaurants. Moving on to Delaware, we soon come to Dover, the state capital. The Delaware Legislative Hall was dedicated in 1933 after two years of construction. In keeping with the colonial history of the state, it is designed in a Georgian Revival style, built of handmade brick, and decorated with an 18th century style interior. Legislative Hall replaced the old State House, which has been restored to its 18th-century appearance and is now a museum located across from Legislative Hall on the mall. Besides formal chambers for the Senate and House of Representatives, it supplies office space for the Delaware General Assembly’s staff agencies. The building is quite a bit larger today than we would have seen in 1962, as it was subject to additions in the 1965-1970 period and again in 1994. Guided tours of Legislative Hall are given daily and include the Hall of Governors, which includes portraits of all of Delaware's governors. South of Dover, US-13 is notable for being the main thoroughfare for the Delmarva Peninsula and though it has not been replaced by an interstate freeway, US-13 has been widened to a divided highway for almost the entire length of the peninsula. It’s most spectacular feature, the Chesapeake Bay Bridge-Tunnel, did not exist in 1962, being opened to traffic two years later. In 1962 we would have crossed the bay via ferry service. The vehicle ferry had operated from the tip of the peninsula since the 1930s, moving US-13 across the mouth of Chesapeake Bay. It was operated by a private corporation, Virginia Ferry Corporation, with a fleet of large and modern ships. By the time the service ended in 1964, it was operating as many as 90 one-way trips each day, but there were still lengthy crossing delays due to heavy traffic and often poor weather. This was partly achieved after 1954, when the Virginia General Assembly acquired the private ferry corporation through bond financing. The Bay-Bridge Tunnel is one of only ten bridge–tunnel systems in the world, three of which are located in the Hampton Roads, Virginia area. The 12-mile bridge–tunnel system saves drivers 95 miles of travel and ​1.5 hours when driving between Virginia Beach and the Delaware Valley area, all without going through the traffic congestion of the Baltimore–Washington, DC area. And it preserves ship traffic without the obstruction of bridge piers across the shipping lanes. After passing through Virginia, US-13 ends midway through North Carolina near Fort Bragg Military Reservation. Fort Bragg is the largest military installation in the world by population, with more than 50,000 active duty personnel. It covers over 251 square miles and is named for Confederate General Braxton Bragg. It is the home of the United States Army's XVIII Airborne Corps and the headquarters of the United States Army Special Operations Command. Camp Bragg was established in 1918 as an artillery training ground when the Army was seeking an area of suitable terrain, adequate water, rail facilities and a suitable climate for year-round training after the end of World War I. Due to the post-war cutbacks, the camp was nearly closed for good in 1921. By 1940, the population of Fort Bragg was 5,400 but ramped up to 67,000 the following year, as World War II approached. After the war, the 82nd Airborne Division was permanently stationed at Fort Bragg, and in 1951, the XVIII Airborne Corps was reactivated there. During the Cold War of the 1950s, Fort Bragg became a center for unconventional warfare with the creation of the Psychological Warfare Center and the 10th Special Forces Group. In 1961, the 5th Special Forces Group was activated at Fort Bragg, to train forces bound for Southeast Asia. President John F. Kennedy visited the fort that year and made the wearing of the Green Beret a part of official dress. In early 1962, the 326th Army Security Agency Company, which had been de-activated after the Korean War, was reactivated. Also in 1962, an operational contingent of that Company was relocated to Homestead AFB in Florida, during the Cuban Missile Crisis. Despite it being an active military base, there are several tourist attractions on the site. I guess I should do something different and visit! We can choose from the 82nd Airborne Division War Memorial Museum, which tells the history of the 82nd, or the JFK Special Warfare Museum, which tells the history of the special forces and psychological operations. There are also some cemeteries on site, including the Longstreet and Shady Grove Churches and cemeteries, where many Civil War dead are buried. And you can sometimes watch paratroopers training at the Sicily Drop Zone. That’s something new for Roadtrip-'62 ™ , so I think I’ll try that! See you later in 1962.